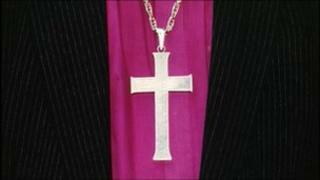 The bishops who lead the Church of England are to include female clergy in their meetings for the first time. At least eight senior women clergy, such as deans and archdeacons, will participate as non-voting members of the House of Bishops. The move is in response to the defeat of attempts to create women bishops. Proposed legislation failed to win the backing of the Church's ruling general synod in November. The Church will reconsider the issue in the summer. Supporters of the change partly blamed the defeat on a failure by the House of Bishops to consult women clergy about the best way to draft the legislation to include exemptions for traditionalists who do not want to serve under women bishops. The proposed legislation needed to gain two-thirds majority support in each of the synod's three houses - bishops, clergy and laity - but fell short by six votes in the House of Laity. In the latest move, at least eight senior women clergy will participate as non-voting members of the House of Bishops until such time as at least six women bishops have been appointed and joined the group by right. BBC religious affairs correspondent Robert Pigott said: "Amid the bitter recriminations that followed the defeat by the Church's ruling synod last year of legislation to introduce women bishops, its all-male House of Bishops received the lion's share of the blame. "In particular, their decision to introduce increased exemptions for traditionalists late in the legislative process was regarded by many in the Church as the main reason for the defeat of the draft law last summer." Our correspondent added that with pressure mounting on the Church to rectify an "embarrassing failure" when the issue returns to the synod in July, bishops are determined to make sure women clergy are included in drafting new proposals, and seen to be included. Viewpoints: Women bishops - where next? What are the issues behind women bishops vote?